Toy - 6" to 8.5"
Small - 8.5" to 12.5"
Medium - 11.5" to 17.5"
Large - 13" to 21"
Extra Large - 16" to 27"
Double Extra Large - 20.5" to 35"
Our four legged friends are really more like family. Let them know how much you love them and appreciate their loyalty with some thoughtful personalized accessories. Your sweet fur baby deserves the best of the best! These collars are the perfect way to add some of your dog's personality to their accessories. These collars are made of a durable nylon weave with thick stitching in order to withstand most wear. They are all easily adjustable with the plastic adjuster. The clips are also made of a sturdy plastic while the leash loop is a strong metal. They come in 6 different sizes from Toy to Double Extra Large. The width of the Toy - Medium is 0.75" and the width of the Large - XXLarge is 1". You will find a length sizing chart in the pictures at the top of the page. Now start personalizing! 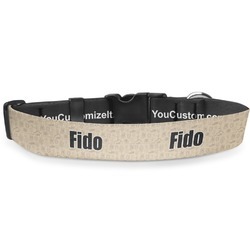 Your dog's collar will be printed on the front with whatever pattern and text you pick. Add their name or a cute saying. No matter what, just have fun! If you ever have any questions or concerns, just give us a call. We are always happy to help! Accessorizing your dog is a walk in the park! Be sure to look through our customized Pet Accessories section where you will find our deluxe dog leashes that go perfectly with these collars. Go all the way and get them a cute bone shaped dog tag as well!